Where travelers once held photos of Flat Stanley in unusual places, photographers now shoot photos of a humble red chair. Long considered simply a place to rest one’s buttocks, the lowly wooden chair has been elevated to celebrity status, and is being welcomed at inns and B&Bs throughout America. It’s all part of a consciousness raising experiment among innkeepers, and during the Thanksgiving week, November 26 through 29, the chair is a guest in Asheville, NC and the Sweet Biscuit Inn. Look for innkeepers Claudia & Christian Hickl shooting images of the Red Chair at the Vance Monument, before the backdrop of the Biltmore Estate and one of the numerous Asheville breweries, as well as the Sweet Biscuit Inn. Throughout 2012 and early 2013, the Red Chair developed a personality of its own being photographed by innkeepers in communities from one end of New England to the other. Starting in Cape Cod, the Red Chair journeyed throughout the six New England states on a nine month tour. Follow the Red Chair’s travels on www.RedChairTravels.com where inspiring photos of the Red Chair can be seen from beaches to bandstands. Throughout 2013 and early 2014 photos and stories from the Red Chair’s journey to nearly twenty states will be added to the website as they are captured. It all started in winter 2012 with a single image. Woods Hole Inn innkeeper Beth Colt posted a picture on Facebook of her simple red chair perched on the ice behind her house and watched her page light up with “likes”. The picture was shared on the Facebook page of Julie Ann Cromer, a photographer from Santa Barbara, CA, who was inspired by the image to visit the Woods Hole Inn and took an amazing second photo of the chair on a local beach. This inspired Colt to share the chair with other innkeepers, sending it on a journey through towns and villages throughout Cape Cod last spring and then throughout the six New England states last fall and winter. As innkeepers all over New England were inspired by the chair, it has taken on a personality of its own. “Now it’s time for the chair to branch out,” expressed Beth Colt. “Innkeepers across the country are clamoring to host the chair, so it’s time to send it coast-to-coast in every corner of America the Beautiful. There would be no Red Chair without the generosity of innkeepers and B&Bs. It’s a barn-raising of sorts; the sharing of a piece of Americana,” concluded Colt. Stories from the Red Chair’s travels have been chronicled on blogs at each stop throughout its journey. Look for tales of the Red Chair’s travels to the Sweet Biscuit Inn on www.facebook.com/SweetBiscuitInn. In a way, its innkeepers’ life story mirrors the voyages of the Red Chair. “There are so many places across the globe we called home,” explained Christian Hickl. “Before discovering the culturally eclectic and open-minded city of Asheville, we had lived in Germany, our country of origin, in New England, home to the Red Chair, and in Provence, France.” Prior to coming to Asheville the Red Chair had found shelter in another North Carolina B&B, the beautiful Inn on Mill Creek in Old Fort, NC. Its next stop will be Tennessee at the Creekwalk Inn in Cosby, TN. For a compilation of these blogs, visit http://www.redchairtravels.com/blog.html. For a complete view of Red Chair photos, visit http://www.redchairtravels.com and get ready to be inspired. 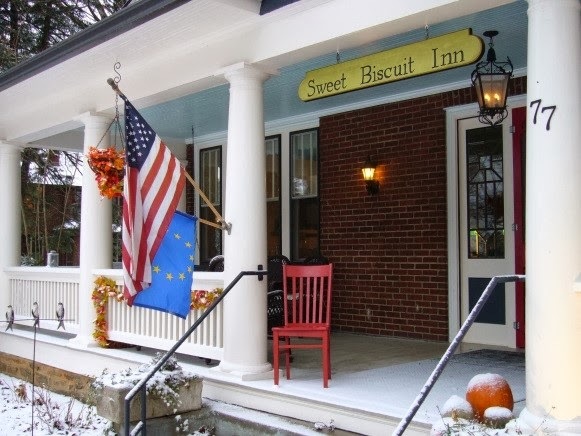 To learn more about the Sweet Biscuit Inn visit www.SweetBiscuitInn.com or call (828) 250-0170.